OUTDOOR RECREATION For information, or to register for Fall Hikes, call 425-430-6700 or visit Rentonwa.gov/cybersignup | 23 r G E N E CO U LO N M E M O R IAL B E AC H 1201 LAKE WASHINGTON BLVD N. Located on the southeast corner of Lake Washington the park consists of 57 acres of beautiful park land, a swimming beach, its own boat launch and two restaurants. 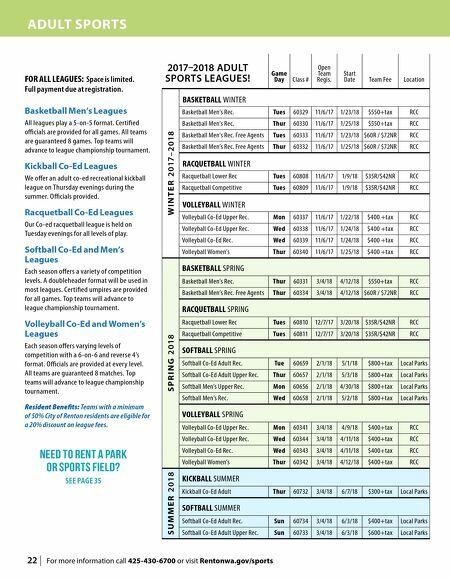 For a full listing of the parks amenities and events visit rentonwa.gov. Park Hours Oct 1–Apr 30: 8:00am–8:00pm May 1–31: 8:00am-9:00pm Boat Launch Info & Fees Open 24 hours a day. Overnight boat moorage is not permitted. Maximum boat length 30 feet. Day Use Permit $10 Res/$20 Non-Res Expires at midnight on day of purchase. 24-Hour Use Permit $20 Res/$40 Non-Res Expires midnight the following day. Permits can be purchased at boat launch kiosk, using Visa or MasterCard only. Annual Passes $60 Res /$120 Non-Res Passes can be purchased at the Renton Community Center. Proof of Renton residency and tow vehicle registration required at the time of purchase. r R E N TO N R OW I N G C E N T E R 1060 NISHIWAKI LANE rentonrowingcenter.org • 425-902-4848 A community boathouse of the George Pocock Rowing Foundation. Located on the south end of Lake Washington, the Center offers a variety of ways to enjoy the water, including summer kayak and SUP rentals, learn to row classes, recreational and competitive rowing, and youth rowing programs. r R E N TO N SAI LI N G C LU B AT COULON PARK www.rentonsailingcenter.org email: Info@RentonSailing.org Located at Gene Coulon Memorial Beach Park at the south end of Lake Washington (next to the canoe launch at north end of the park). 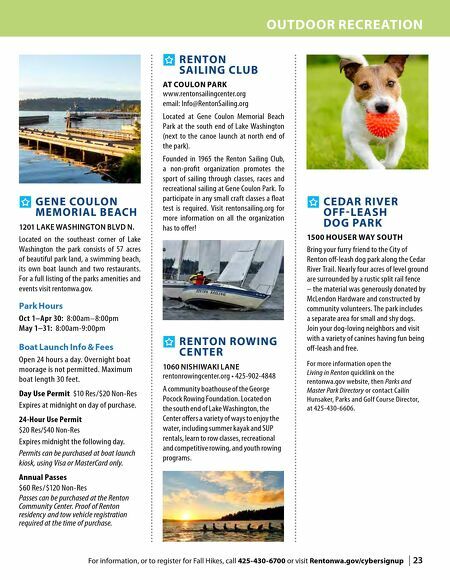 Founded in 1965 the Renton Sailing Club, a non-profit organization promotes the sport of sailing through classes, races and recreational sailing at Gene Coulon Park. To participate in any small craft classes a float test is required. Visit rentonsailing.org for more information on all the organization has to offer! r C E DAR R I V E R O FF - LE A S H D O G PAR K 1500 HOUSER WAY SOUTH Bring your furry friend to the City of Renton off-leash dog park along the Cedar River Trail. Nearly four acres of level ground are surrounded by a rustic split rail fence – the material was generously donated by McLendon Hardware and constructed by community volunteers. The park includes a separate area for small and shy dogs. Join your dog-loving neighbors and visit with a variety of canines having fun being off-leash and free. For more information open the Living in Renton quicklink on the rentonwa.gov website, then Parks and Master Park Directory or contact Cailín Hunsaker, Parks and Golf Course Director, at 425-430-6606.